Going off on a slight tangent, which format of Perfmon log should you use? The four choices are Binary (BLG), Tab Delimited, Comma Delimited, and SQL Database. Binary is useful for most purposes, but becomes harder to extract the data out if you want to run any other processing on it. Tab and Comma delimited have the benefit of being able to view the data in Excel (if you don’t have too many counters), and graphing can be easier. 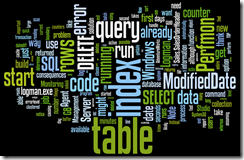 SQL Database has the benefit of logging straight into a SQL database, and this allows you to write a query to process your Perfmon data. For example, you could create an hourly average, or pull out the date/times of peak loads. The drawback to using a SQL database is that it’s not as lightweight – you quickly store a lot of data in your database, and increase the load on your server. A good compromise may be to log into binary format, and then use the relog.exe command line tool to convert the data into SQL or comma/tab delimited format (which can then be opened in Excel or bulk-loaded into a database). Worlde seems to be the in thing going around the SQL Server blogging community this week, so I figured I’d knock one up of this site. Click for a larger image. 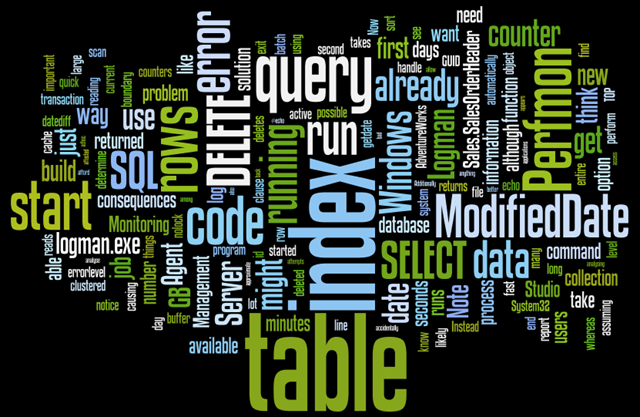 Apparently I enjoy talking about tables, indexes, queries and Perfmon. Sounds about right. In my previous post, I discussed using Logman to automatically start Perfmon counters logging. The solution involved running logman.exe to start the collection, and if the counters were already running you’d get an error message saying words to that effect. The problem with this solution is SQL Agent will report that the job failed as the error code returned by Logman is non-zero. You can tell SQL Agent a specific code to use as the “success” code, but the user interface will not allow big negative numbers, such as -2144337750 (which is what Perfmon returns if the counter is already running on my Vista machine. Windows 2003 returns a different code). While you may be able to enter this value via script, I’m not sure how Management Studio will handle it, and could cause problems down the line if you edit the job. That’s it! Now the job will report as succeeded if the collection is already running.